Marsh-marigold (Caltha palustris), also known as 'kingcups' is a medium-sized member of the buttercup family Ranunculaceae. Growing up to 80cm high, this colourful plant is found in wet meadows, marshes and wet woodlands, and grows particularly well in the shade. 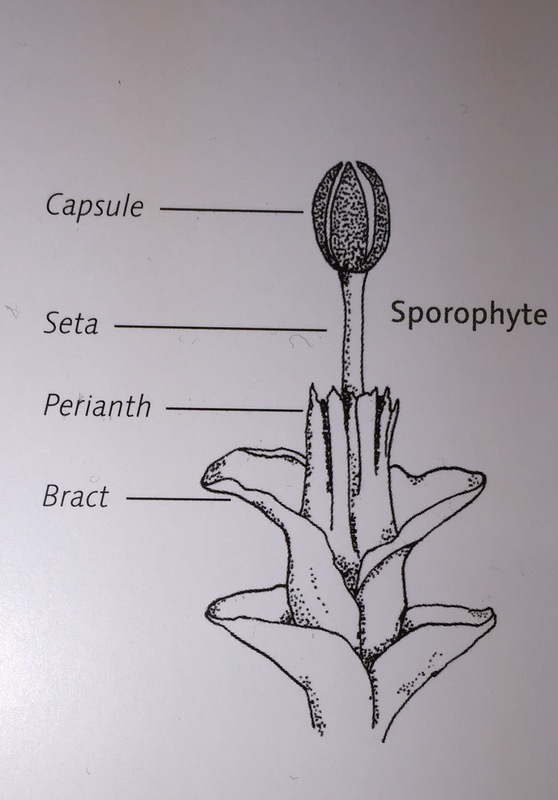 Its flowers are quite large - between 15-50mm in diameter, and it is one of the early flowering plants, with flowers appearing in March and lasting until June/July. 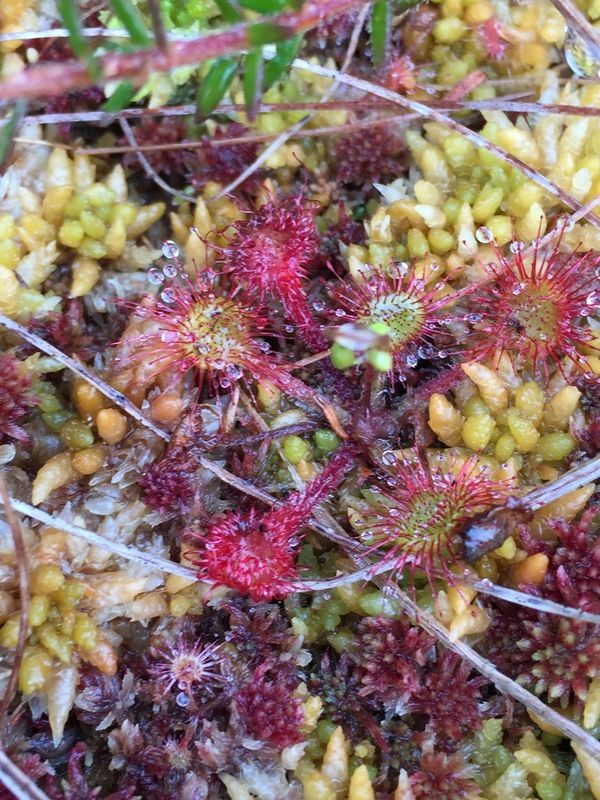 In autumn, the plants die back down and overwinters with buds near the surface fo the marshy soil. Marsh-marigold (Caltha palustris) growing along the broad at UEA. In terms of its ecology, Marsh-marigold only grows in freshwater locations with oxygen-rich water near the surface of the soil. It is quite a good bioindicator of pollution as it avoids areas with fertiliser application and high levels of phosphate and ammonia. However, it is often associated with iron-rich seepages because iron reacts with phosphate, thus making it unavailable for plants. 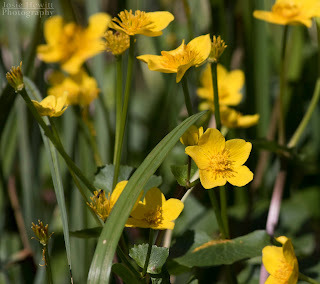 In the UK, Marsh-marigold is quite widespread and its population remains fairly stable, however, it is locally threatened by drainage and agricultural improvement of wet grassland habitats. C. palustris var palustris which has yellow sepals, tricolpate pollen (pollen with 3 furrows) and is not rooting at the nodes. C. palustris var radicans which also has yellow sepals and tricolpate pollen, but is distinguished by the plants being smaller and with fewer flowers on the stems as well as rooting at the nodes after flowering. C. palustris var araneosa also has yellow sepals and tricolpate pollen, however the plants are larger, and have many flowers on the stem and only occurs in the fresh water tidal zones of the Netherlands. C. palustris var alba has white sepals, usually pantoporate (with rounded opening all over the surface) pollen (although sometimes tricolpate), and is only found between 2200 and 3500m along rivulets in Afghanistan, Pakistan and the western Himalayas. C. palustris var purpurea has magenta sepals, tricolpate pollen and is only found between 4000-5000m on alpine meadows and mossy slopes in the eastern Himalayas. Despite some serious safety concerns, people use the flowering parts of Marsh-marigold that live above ground to try and treat a variety of ailments, including cramps, jaundice and liver problems. Some people also put Marsh-marigold directly on the skin to clean wounds and sores. However, there is no evidence that Marsh-marigold actually works to treat any of these conditions and as with all buttercups it is poisonous and can cause skin irritation, so you shouldn't try it at home! 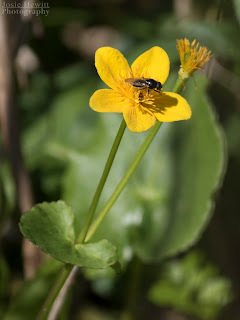 Marsh-marigold (Caltha palustris) with a Hoverfly species assisting with pollination. Yesterday we headed to Foxley Wood, which is about 30 minutes NW of Norwich, on an Ecology field trip. 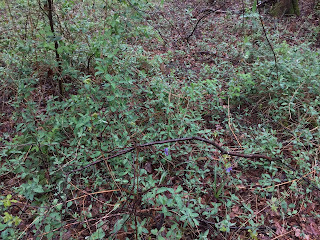 The purpose of our visit was to learn about coppicing as a management strategy, ancient woodland indicator species and to have a go at some plant identification. Unfortunately, we didn't do much of the latter due to the terrible weather. Foxley Wood is Norfolk's largest remaining ancient woodland and over 350 flowering plants have been recorded on the site. This includes one of the UK's least known native trees: the Wild Service Tree Sorbus torminalis, which is rather inconspicuous for most of the year, until it becomes covered with white blossom in late spring and its leaves turn a coppery-red colour in autumn. 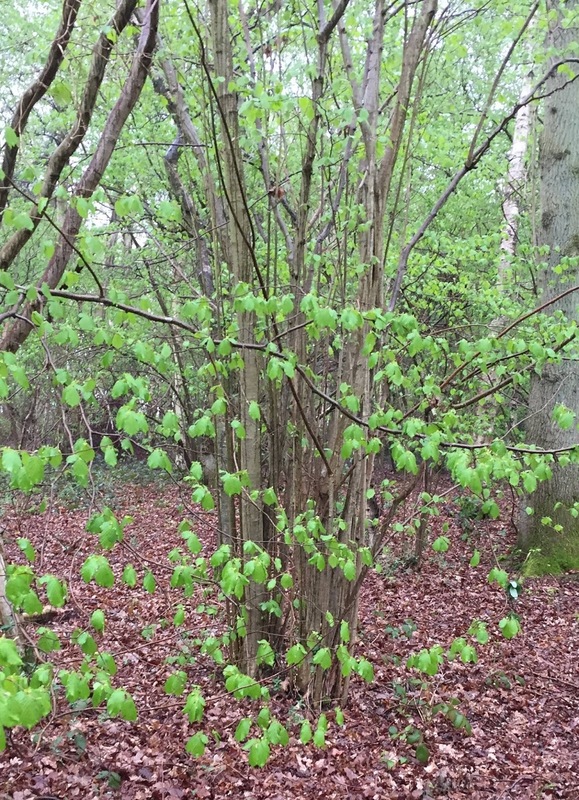 Coppicing is an ancient woodland management technique that is used extensively at Foxley Wood in order to maintain a matrix of woodland growth stages to benefit biodiversity. Coppicing involves felling the same stumps near ground level and then allowing shoots to regrow from that stump, whilst also leaving certain large trees (standards), typically mature oaks. 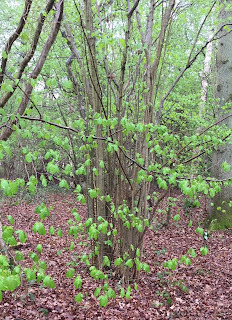 Where coppicing occurs, the woodland is often divided into blocks and coppiced on a rotational cycle of about 15 years in order to maintain a variety of woodland ages. 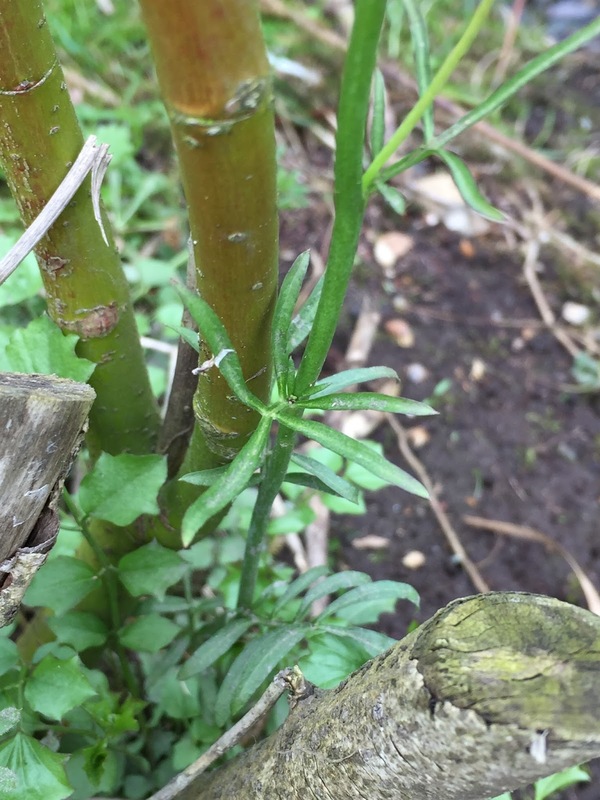 Historically, coppicing was used to produce numerous straight stems from each coppiced stump, which would then be used for posts, fencing and firewood. growing from the coppiced base. During our wander around Foxley Wood, it was really interesting to see the different ages of coppice blocks and to be able to compare and contrast it with the ancient woodland and grazed areas. This allowed us to see first hand the effects of the different management practices and I found it particularly interesting to see the stark differences in the under storey between the coppiced areas and the ancient woodland, and also how the plant assemblages changed too. coppiced areas and much thinner in the ancient woodland. Rarely occur outside of woodland, and if they do, then they indicate a long temporal continuity of woodland cover. Capable of growing in shade, though don't necessarily grow exclusively in shade. Reliable indicators, in at least part of the region being surveyed. Slow colonisers - normally have a small seed shadow, meaning that seeds don't disperse very far each year, so colonisation of new areas is slow. 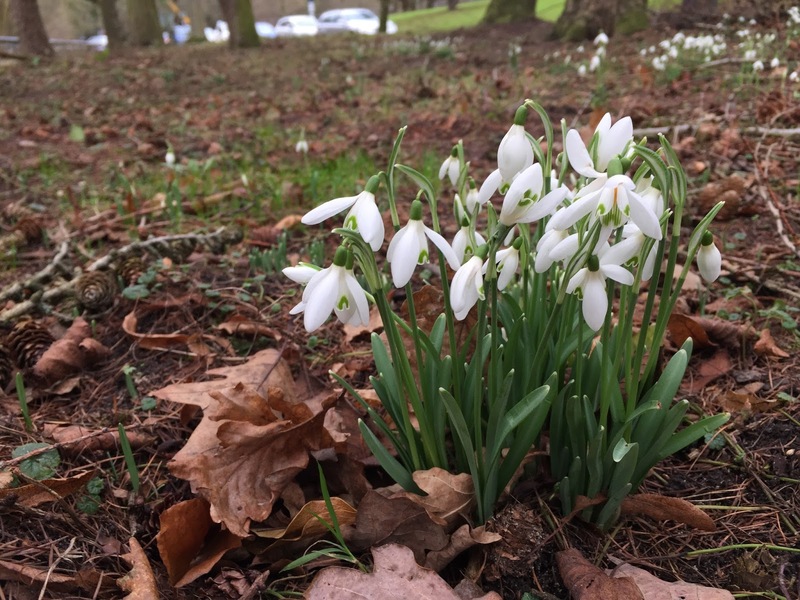 There are approximately 100 plant species that are thought to be good indicators of a woodland's age, and when a woodland shows more than about 10 of these indicator species, it is likely that the wood has existed for a long time. 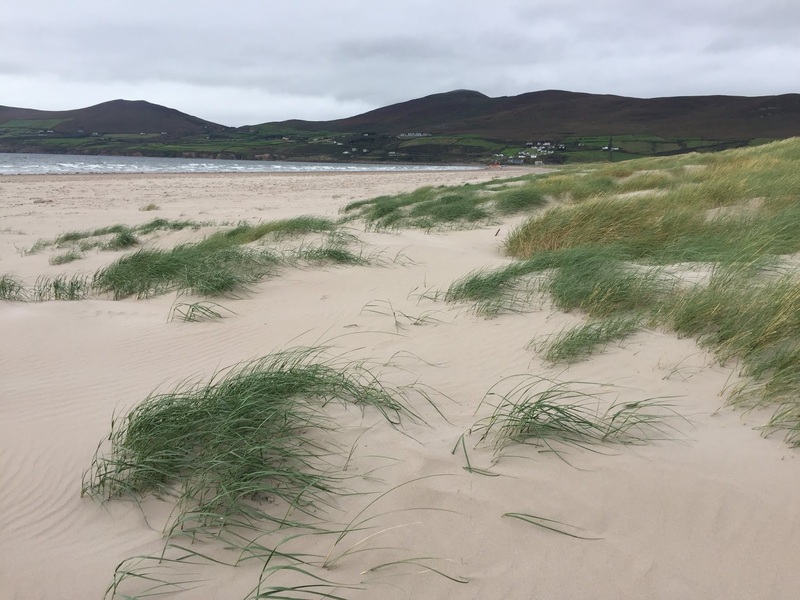 AWIs vary between the different regions of the UK and finding one AWI species alone is not enough to determine a woodland's age, but finding combinations of AWIs suggests different things about the woodland's age. woodland indicator species that we were looking for. While at Foxley Wood, we were on the lookout for 12 AWI plant species, and despite the dreary weather we managed to find 7 of them. One of the AWI species that we managed to find was Wood-sorrel Oxalis acetosella (also known as Common Oxalis). The Oxalis part of the binomial is due to the presence of oxalic acid within members of the genus, while acetosella is in reference to its sour taste. Wood-sorrel is a small plant that flowers between April and May. It has white flowers which droop down until the dappled sunlight reaches them, upon which the flowers tilt upwards. Each flower has 5 petals and tiny, purple veins. The leaves of Wood-sorrel are trefoil and fold down into a tent during the night, but flatten out again during the day. Apparently, all parts of Wood-sorrel plants are edible, and the leaves (fresh or dried) are often used in alternative medicines. The leaves are said to have diuretic, antiscorbutic and refrigerant actions, and a decotion (an extract made by mashing, then boiling the plant) made from the pleasantly acidic leaves is used for high fevers, both to quench thirst and allay the fever itself. Although it may be consumed freely, excess consumption should be avoided as the oxalic salts are not suitable for all constitutions and may have unwanted effects. 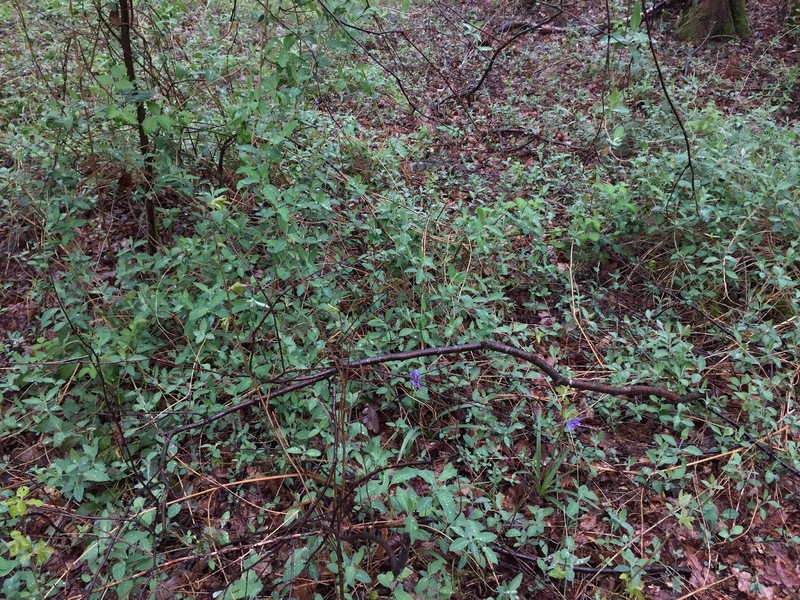 JNCC publication on "Coppiced Woodlands: their management for wildlife"
Garlic Mustard Alliaria petiolata is a biennial plant in the mustard family (Brassicaceae). As it is biennial, it takes two years to complete its lifecycle. In its first year of growth, the plant grows slightly wrinkled leaves which are round in shape and smell like garlic when crushed. 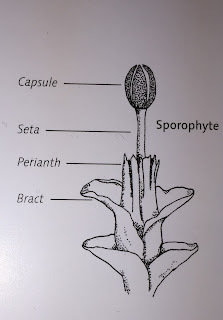 Flowering occurs in the second year of its lifecycle, and the plant produces white, cross-shaped flowers in a dense bunch at the top of the plant, which appear from April through to June. At a glance, Garlic Mustard plants resemble nettles, however they can be distinguished by their smooth, hairless leaves which are somewhat heart-shaped, as well as the terminal clusters of the small, white flowers. 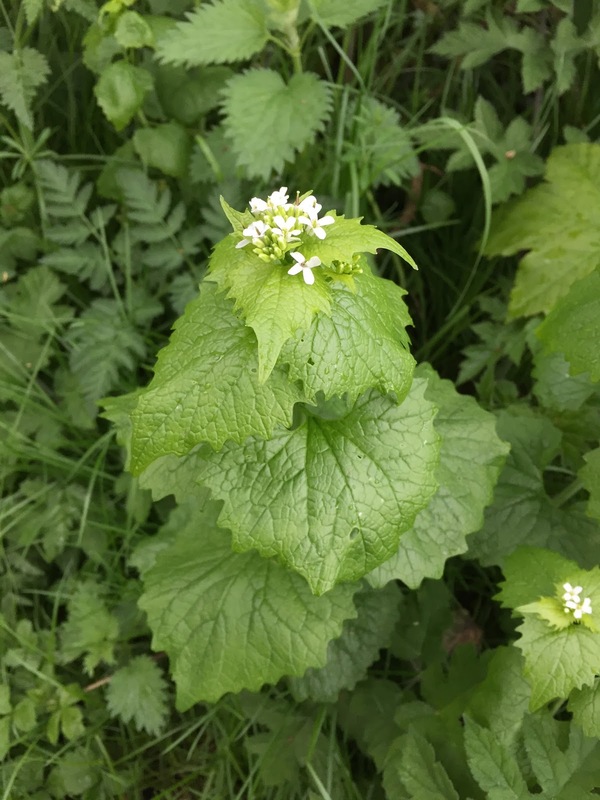 Garlic Mustard can grow up to 1m tall and are found in a variety of habitats, including wood margins, hedgerows, roadsides and shady places. It is a native species which is found throughout the UK, being very common in England and Wales. common among the nettles in the shady, wooded areas. Garlic Mustard has a long history of use in food and medicine, being one of the oldest known spices used in cooking in Europe - archaeological evidence of its use in the Baltic dates back to 4100-3700 B.C.E. It is not really used in medicine any more, but was once used as a disinfectant or diuretic. Garlic Mustard has a variety of cooking uses, with the chopped leaves used to flavour salads and sauces, including pesto. The young leaves are preferable for this use as they provide a mild flavour of garlic and mustard; sometimes the flowers and fruits are used as well! In France, the seeds are also used, often to directly season food. In Europe, 69 species of herbivorous insects are associated with Garlic Mustard, as well as 7 species of fungus. These include various members of weevils (especially the genus Ceutorhynchus), leaf beetles (Chrysomelids), butterflies and moths (Lepidoptera). Garlic Mustard is even a food plant for the larvae of the Garden Carpet moth. Dendrocoelum lacteum is one of only 12 species of freshwater triclads found in Britain and Ireland. The Tricladia are named as such due to the three main branches of the alimentary canal. Tricladia are a sub-order of the Turbellaria which sits within the phylum Platyhelminthes. Turbellaria are a globally widespread group, with new species continuing to be described. They also occur in such large numbers in some lakes that they are considered a significant components of aquatic communities. Due to their dorso-ventral flattening, Triclads are commonly referred to as "flatworms". The adults range in size from approximately 8-15mm in length. All except one of the 12 British & Irish (B&I) species are normally found in the surface waters of lakes and streams, where they feed on a variety of prey species, including isopods (woodlice etc. 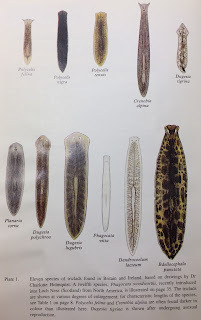 ), gastropods (snails and slugs) and oligochaetes (worms). Each species has its own realised niche though, which has evolved to allow coexistence. 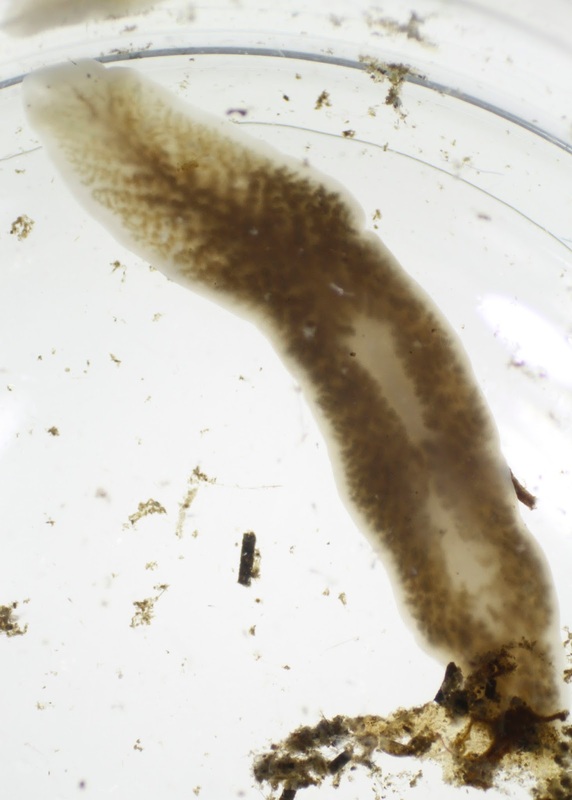 For example, D. lacteum feeds mostly on isopods, while Dugesia polychroa prefers snails and Polycelis nigra and Polycelis tenuis favour the oligochaetes. 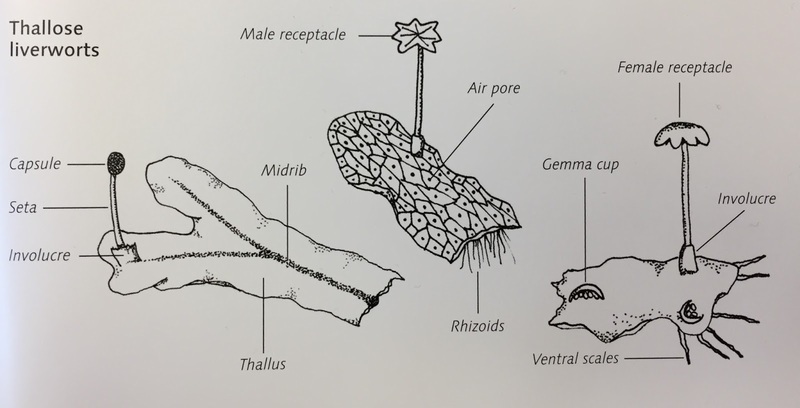 Illustrations of 11 of the 12 species of triclad that have been found in Britain & Ireland. Taken from "A key to the freshwater triclads of Britain & Ireland"
by T.B. Reynoldson and J.O. Young. British freshwater triclads can be categorised into two groups: those that are found in lakes, and those that inhabit streams, however this distinction is not absolute. When they are found in lakes, triclads prefer sheltered, stony shores and are most abundant in shallow waters up to a depth of 30-35cm. 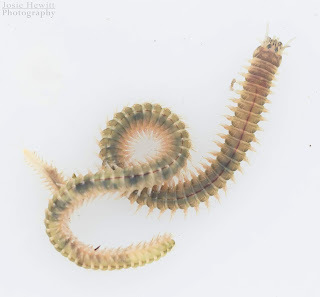 On the continent, stream-favouring species are spatially separated downstream, with Crenobia alpina (and sometimes Phagocata vitta) found near the source, with Polycelis felina occurring further downstream, followed by Dugesia gonocephala (not recorded in B&I). A similar pattern of distribution can also be seen in Britain, with P. nigra inhabiting the lower reaches of streams and rivers, however C. alpina and P. felina can cause complications as both occur along the length of short streams (although there is often spatial separation related to stream gradient). Triclads are interesting in terms of their reproduction, because different species reproduce either sexually, asexually (by fission & regeneration) or both! Asexual reproduction is though to have evolved secondarily in the Dugesiidae and Planariidae families, to allow reproduction even when food is limiting. Another interesting thing is that pseudogamic reproduction is common among several species. This is where sperm is necessary to stimulate egg development, but no male chromosomal material is incorporated into the egg nucleus! 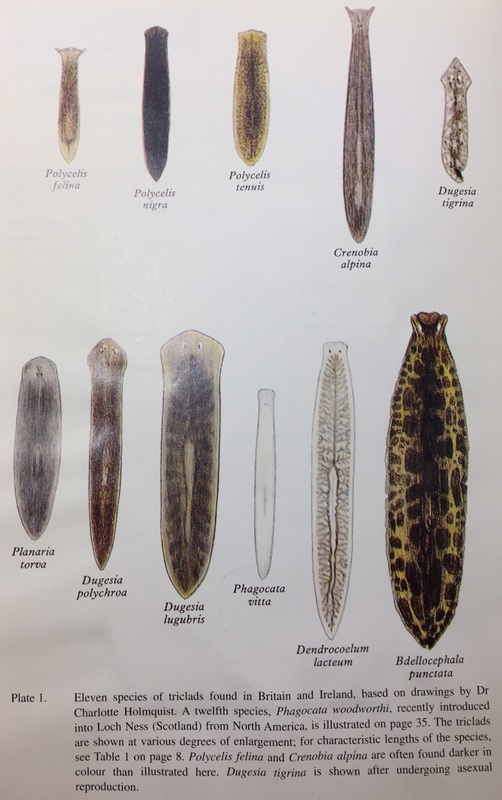 Of the lentic species (those living in still waters such as lakes), there are two main types of life histories: D. lacteum, Bdellocephala punctata and Planaria torva are 'annuals' that die after their spring breeding season, meanwhile P. nigra, P. tenuis, D. polychroa and D. lugubris don't die after breeding. The latter group exhibit iteroparity, breeding numerous times during their lifespan, while the former group exhibit semelparity, which is where they breed once and then die. No one really knows why these two life histories have evolved, but there are many different hypotheses, including a relation to their feeding strategies or a reduction in interspecific competition. structures throughout. Specimen collected from the River Yare. According to the 2009-2011 Biodiversity Audit, 5 species of triclad have been recorded on the UEA campus. One of these is Dendrocoelum lacteum, a pale and fairly large species of freshwater triclad, and one that I recently found a specimen of in a still part of the River Yare. It is a lentic species which ranges between 14-25mm in length. In the UK, it is quite common and is most frequently found in productive lakes where the calcium concentration is at least 10mg per litre. 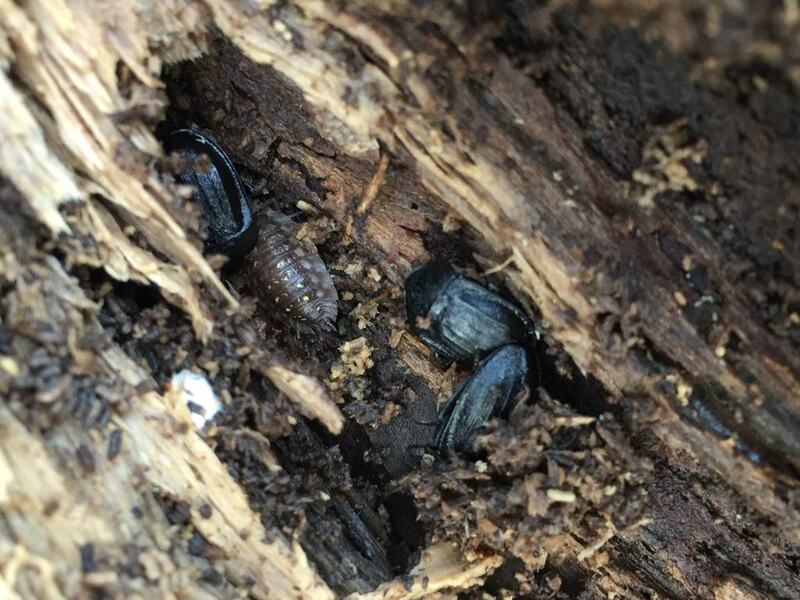 D. lacteum predominantly feeds on Asellus isopods and the triclad's distribution is closely linked with that of its prey, providing D. lacteum with a "food refuge". In order to capture intact prey, D. lacteum moves faster than the Planariid species, and has a shallow anterior pseudo-sucker. Its distribution in Britain is mostly curtailed by interspecific competition and has not yet spread into northern Scotland or the western islands. Lesser Celandine (Ficaria verna) is one of the first signs of spring, with flowers appearing in late February/March. 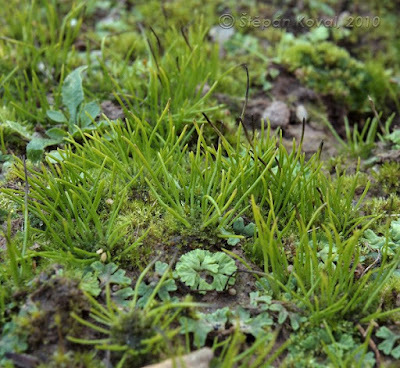 It is often present in large colonies along woodland floors, with its distinctive heart-shaped leaves forming a lush green carpet, punctuated with its bright yellow flowers. 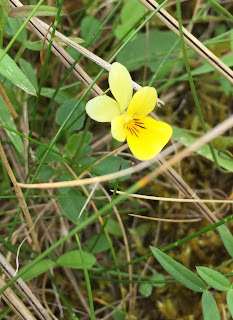 The flowers are between 2-4cm in diameter and have 3 sepals and between 7-12 petals. Lesser Celandine is plant characteristic of woodlands, and is often used as an Ancient Woodland Indicator species. However some caution must be used, as it can also be found in hedgerows, damp pastures and river/stream sides. in the woods near the Broad on the UEA campus. There are many different subspecies of Lesser Celandine, however Ficaria verna sensu lato is native to central Europe, north Africa and Caucasus. It is not native to North America, though it has been introduced to many parts and is now considered as an invasive species. As with Marsh-marigold, and all other species in the Ranunculaceae family, Lesser Celandine contains a compound called ranunculin, which turns into the toxin protoanemonin when the plant is wounded. Contact with damaged/crushed Ficaria leaves can cause itching, rashes or blistering and ingesting the toxin can cause nausea, vomiting, dizziness or paralysis. Due to its potential toxicity and its proliferation, Lesser Celandine has been banned or listed as a noxious weed in several US states. It is actually possible to neutralise the toxicity of Lesser Celandine, and there are a few different methods that can be used. Simply drying out the plant is effective as the protoanemonin changes to the non-toxic anemonin, which is further broken down into non-toxic dicarboxylic acids. Cooking the plants also eliminates the toxicity, and after cooking or drying the plant can be incorporated into food or herbal medicines... 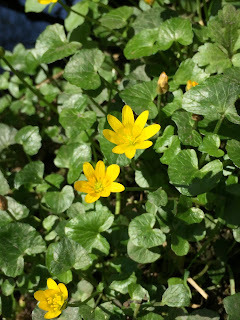 Lesser Celandine has long been used by herbalists as a treatment for haemorrhoids, by applying an ointment of raw leaves as a cream to the affected area. Luckily most modern guides point out that medicines should be made from the dried herb or by heat extraction due to the toxicity of raw or untreated plant or leaf extracts. Cuckooflower (Cardamine pratensis), also known as Lady's-smock due to its emergence around Lady's day, is an unbranched perennial (lasts for 2+ years) that can grow up to 60cm tall. It is incredibly variable and its flowers can be any shade of white, yellow, pink or purple. The flowers themselves are 12-18mm across, with each of the 4 petals being about 3x as long as the sepals. There are two types of leaves, with the basal leaves being pinnate and forming a rosette, with the terminal (end) leaflet being larger than the lateral leaflets. The leaves on the upper part of the stem are all narrow (as can be seen in the photo below). C. pratensis is a common, native species, which is widespread throughout the UK and all of Europe (except the Mediterranean). It is not overly picky in its preferred habitats, and as such, can be found up to 1080m in damp grasslands, marshes, roadsides, hedgerows and stream sides. The flowering season of Cuckooflower is between April and June and it gets its common name because the emergence of the flowers often coincides with the spring arrival of the first Cuckoos in the UK. There are many wive's tales associated with the Cuckooflower in different countries. Legend has it that the plant is sacred to fairies and anyone who took them indoors would be hit with bad luck. In Germany, it was believed that anyone who picked the Cuckooflowers would be struck by lightning and in France, the Cuckooflower was thought to be the Adder's favourite and so if you picked them, you would get bitten by an Adder before the following May. Many species of pollinating insects are attracted to Cuckooflowers, and it is one of the food plants for the Orange Tip butterfly (Anthocharis cardamines). There is some historic medicinal use of Cuckooflower, whereby it is said to be slightly excitant and anti-scorbutic as well as sometimes being used as a diuretic. However, by 1900, the use of Cuckooflower in herbal medicine had greatly declined, except that an infusion was taken to aid digestion. Modern day uses of Cuckooflower mainly revolve around dried samples being used in infusions or as a compress to help treat rheumatic pains. 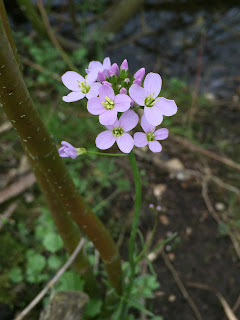 The young leaves, young stems and flowers are all edible and are often included in salads as they are said to taste like watercress. In Britain, there are only four species of Bee-fly in the genus Bombylius. These are: B. canescens, B. minor, B. discolor and B. major. Of these 4, B. canescens and B. minor are the rarest, with the former mainly confined to the open, flowery habitats of south-west England and south Wales, and the latter only recorded in Dorset and the Isle of Man in recent times. 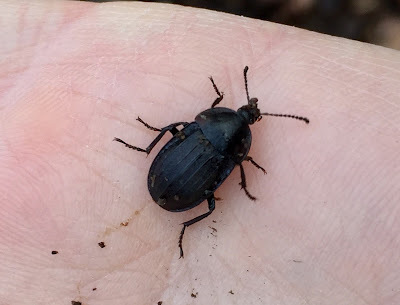 B. discolor is more common than the previous pair, however it is still largely confined to southern England and the south Wales coast, though records from Warwickshire indicate that it is spreading north. Bombylius major is the most common of the 4 British Bombylius species and is easily distinguished from the others by the solid dark band on the leading edge on the wings. This feature has also inspired its imaginative name of the 'Dark-edged Bee-fly'. 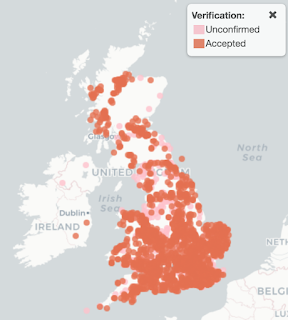 Its distribution covers practically all of England and Wales, and the some parts of Scotland. It is also the only species of Bombylius found on the UEA campus. Bee-flies are named as such because they are flies which mimic and parasitise bees. They are fairly large for a fly, with the body length of B. major measuring 6-12.5mm (not including the extended proboscis). 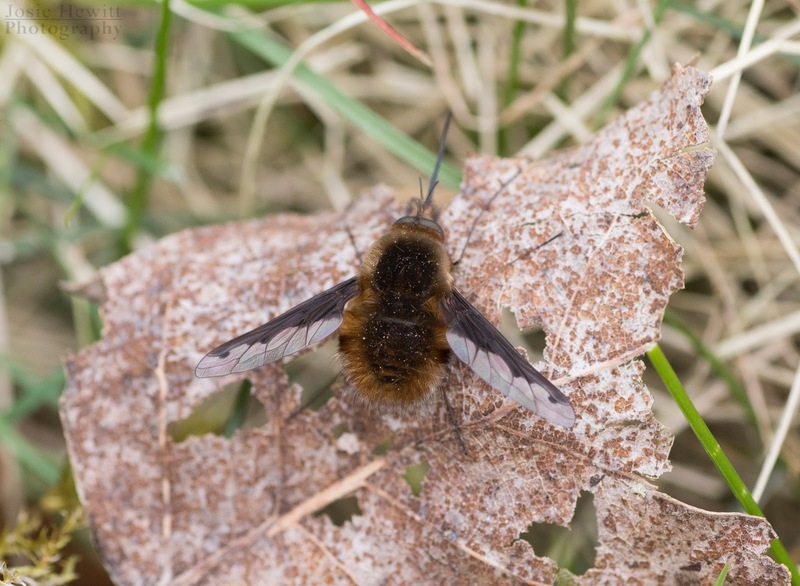 Bombylius species generally inhabit open areas, such as gardens, grasslands and open woodland clearings, although the Western and Heath Bee-flies (B. canescens and B. minor) require more specialist habitats. off its ridiculously long proboscis! Bombylius species have a very interesting life cycle as they lag their eggs in the nests of solitary mining bees. The bees species that they parasitise varies between bee-flies. Andrena species of bee are the main hosts of B. major and B. discolor, with the latter particularly favouring Andrena flavipes and Andrena cineraria. B. canescens favour the Lasioglossum and Halictus species, while B. minor chooses species of Colletes mining bees. In order to parasitise their chosen species, the adult female bee-flies collect sand or dust at the tip of their abdomen and use it to coat their eggs. 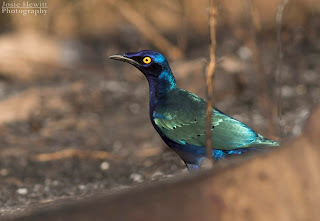 It is thought that they do this in order to camouflage them and to make the eggs heavier. Increasing the weight of the eggs makes the next stage easier, whereby the female locates a nest entrance of the chosen mining bee, hovers above the hole, and proceeds to flick her eggs into the burrow - the additional weight on the eggs makes this task marginally easier to accomplish! Once the bee-fly's larva hatch, it crawls further down into the burrow and wait until the host bee's own larvae are almost full-sized. It's at this point that the bee-fly larva attacks the bee larva, feeding on its bodily fluids and eventually killing it. Obviously this behaviour is bad news for the bees, however bees and bee-flies have coexisted for millennia, with no evidence that bee-flies cause declines in their host bee populations. The Water Vole Arvicola amphibius is a small, semiaquatic mammal which is found throughout most of Europe, Russia, West Asia and Kazakhstan. They are much bigger than the other UK voles, and are distinguished from Brown Rats by their slightly smaller size, chestnut-brown fur, rounded nose, fluffy tail and small, rounded ears that don't protrude from the fur. Their brownish colouring helps them to blend in with their environment. In the UK, Water Voles live in burrows that are generally excavated along the banks of slow moving and calm rivers, streams and ditches. Their burrows have many floor levels within, in order to prevent flooding, as well as nesting chambers and a food store for the winter months. If no suitable banks are available, then they can also live above ground in reed beds where they will weave ball-shaped nests. Water Voles generally prefer lush riparian vegetation as it provides them with cover when they are on the river banks. Water Voles are herbivorous, mainly eating grass and other riverside vegetation. 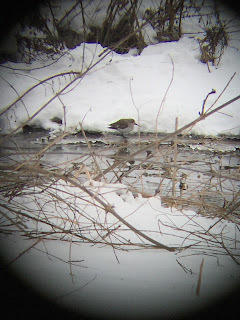 They often sit in the same spots too, so little piles of nibbled grass and stems can build up on the river's edges. Due to the way Water Voles eat, the nibbled grasses and stems always show a distinctive 45° angled-cut at the ends. 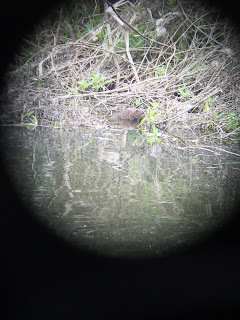 Rubbish photo of a very cool species! A typical Water Vole is approximately 20cm long, plus a tail of around 11cm, although their weights can vary a lot, from 80-180g. Apparently, the minimum weight needed to survive each winter is 112g for females and 115g for males, and on average, Water Voles only live for 1.5 years. Water Voles are the UK's fastest declining mammal, suffering catastrophic declines during the 20th century. 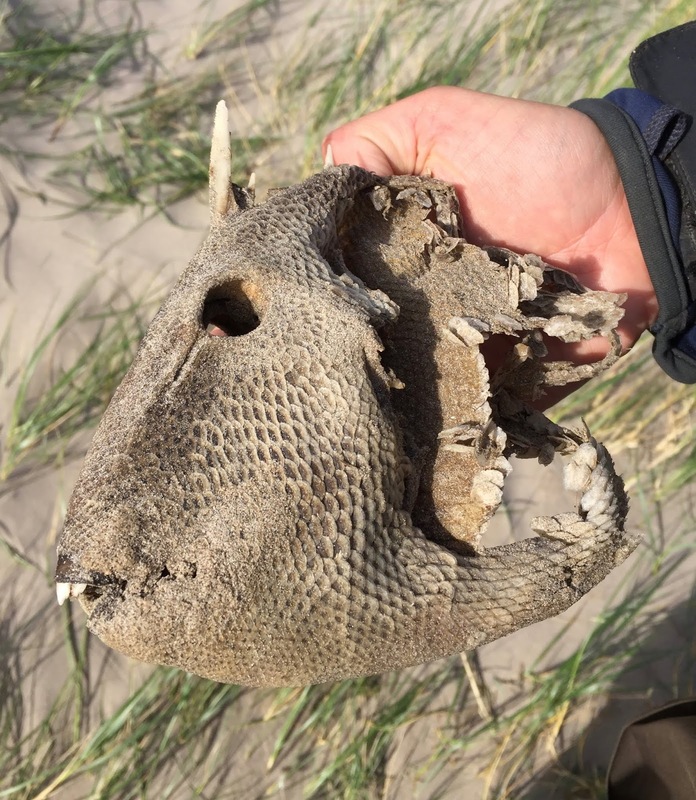 During the 1940s and 1950s, agricultural intensification caused widespread loss and degradation of habitat, but the major cause of the Water Vole's decline was the release of hundreds of American Mink from fur farms in the 1980s and 1990s. The usual defence mechanisms of Water Voles include diving under water and kicking up a screen of dirt or running into their burrows, however these techniques are insufficient to escape mink. Between 1989 and 1998, the Water Vole population fell by almost 90%, and currently stands at around 875,000. Due to their extreme declines over the last few decades, Water Voles are protected under section 9 of the Wildlife & Countryside Act 1981, and are also classed as a UK Biodiversity Action Plan (BAP) species. Numerous re-introduction projects have been undertaken around the UK, with most proving successful and Water Voles have now returned to every county in England. We are lucky to have Water Vole living on the UEA campus, along the River Yare, and seeing one brightens up every walk! 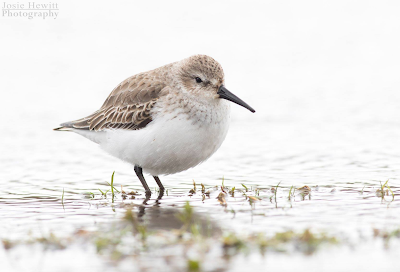 Head to any coastal mudflats in the winter, and you are likely to see a whole host of wading birds, including Dunlin (Calidris alpina), Turnstone (Arenaria interpres), Sanderling (Calidris alba) and Knot (Calidris canutus). Dunlins are the most common of these winter waders and often feed in flocks, so where there's one, there's usually a whole lot more somewhere nearby! Dunlins are small wading birds that have a slightly decurved black bill, black legs and a short primary projection. Their wingspans range between 33-40cm and they weigh around 49g. As with most waders, Dunlins moult between their two plumages, a brighter, more colourful one for the breeding season, when they need to look their best, and a fairly dull, grey-brown one for the winter, when looks aren't so important. Using a combination of sight and touch, they feed on a variety of invertebrates, including insects, molluscs and oligochaete worms. Dunlin (Calidris alpina) in breeding plumage. 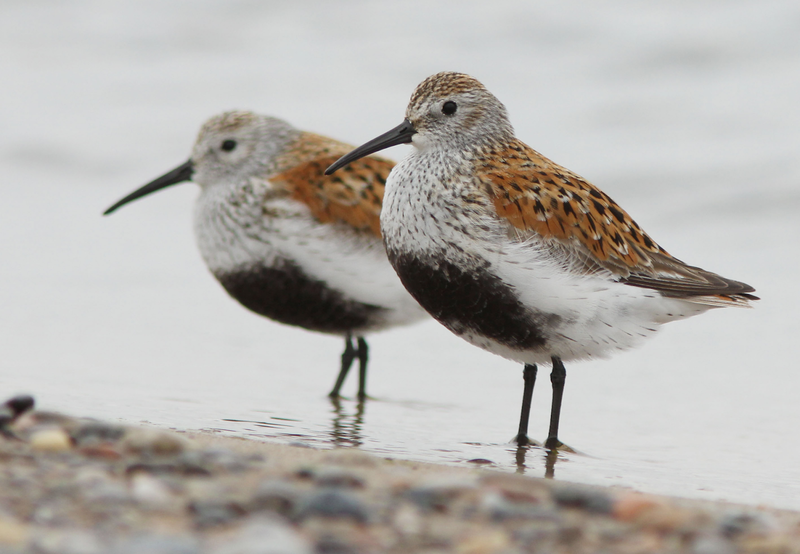 There are currently 10 subspecies of Dunlin that are officially recognised, however the taxonomy surrounding this species is very complex and often changing. Of the 10 official subspecies, 3 have been recorded in Britain: schinzii, alpina and arctica. The schinzii subspecies of Dunlin breed in the UK, with around 9,600 breeding pairs and winter in west Africa, while the arctica subspecies are birds that breed in Greenland and pass through the UK in autumn in small numbers. The C. a. alpina subspecies breeds across Siberia, all the way to northern Scandinavia and account for pretty much all of the Dunlins that winter in the UK. At the end of February, the UK was struck by the 'Beast from the East', or as most of Northern Europe calls it, winter. This resulted in about a week of sub-zero temperatures and heavy snow here in East Anglia. 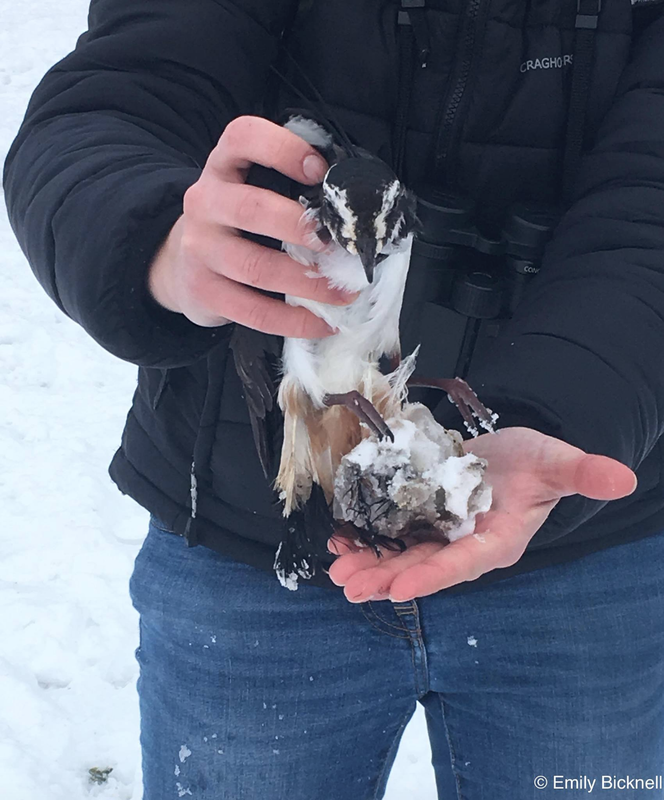 The freezing conditions and snow cover caused many problems for wildlife, with many reports of dead birds across the country and East Anglian region. 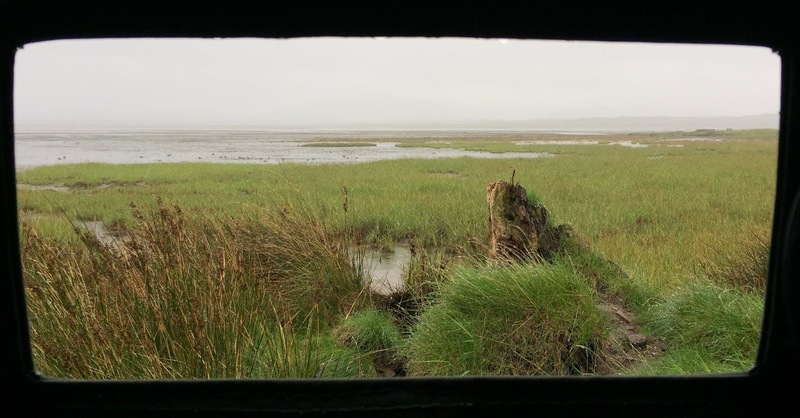 Waders were particularly vulnerable as they rely on being able to probe muddy areas to find food, however since the conditions caused widespread freezing, they weren't able to access their usual food resources for a prolonged period of time, leading to starvation. During the cold spell, some of my Ecology course mates and I tried to venture out as often as we could to do some proper winter birding. 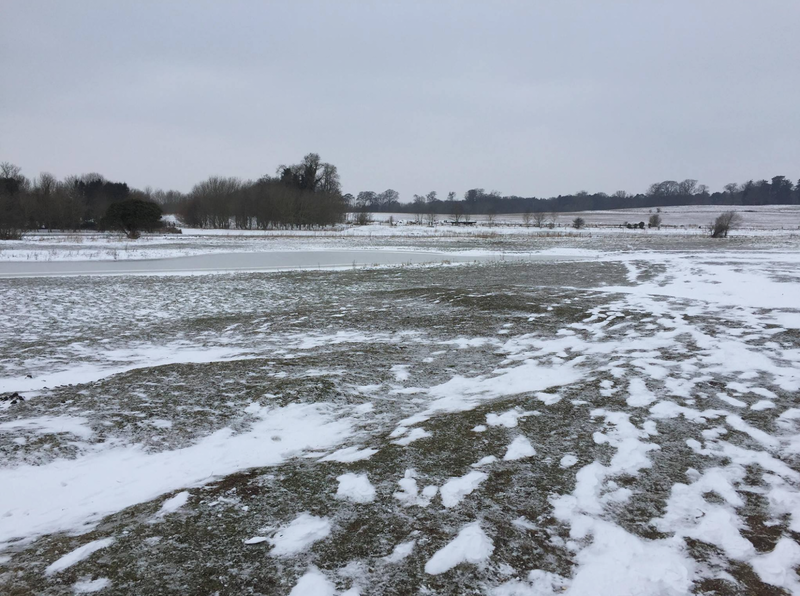 On 3rd March all our lectures were cancelled, so we made the most of it and spent all day out birding around Earlham, Colney, Bowthorpe and Threescore. During our travels we came across a pair of Lapwings, including this unfortunate individual, which had a large ball of ice stuck to its tail, preventing it from flying. We dutifully broke up the ice ball and then warmed it up for a few minutes, before releasing it to join its mate on the river. 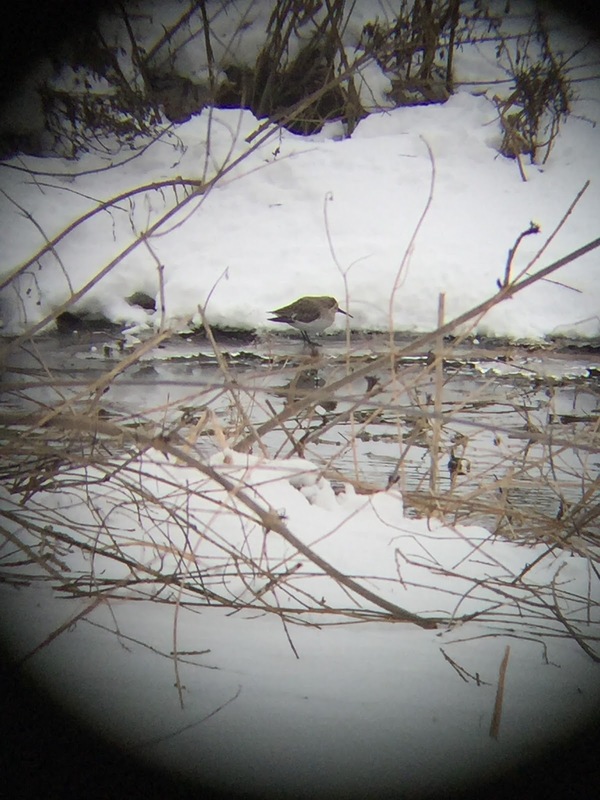 It was very bizarre to see, but I suppose it may have roosted on the edge of an unfrozen puddle, which froze overnight or something... I guess we'll never know. Lapwing (Vanellus vanellus) with a large ball of ice attached to its tail. Anyway, back to the topic of this post, the Dunlin. A few days prior to the Lapwing encounter, a few of us had headed out birding along the River Yare when we spotted a Dunlin at the water's edge. Dunlins are a decent bird for the UEA recording area, especially when they're on the ground like this one. It was nice to see, even if it did look a bit sorry for itself in the freezing conditions. Before we carried on our walk, someone made a joke about the Magpies that were loitering around... so to skip to the end, as we returned from our wanderings later that day, we decided to head back along the Yare to see if the Dunlin was still moping about. It was. before it got taken by a Magpie. A few days later, once the snow had melted and the ground had (mostly) thawed, another Dunlin rocked up on Earlham Marsh, where we enjoyed nice views of this more perky looking bird and the other UEA birders managed to see it as well. Dunlin (Calidris alpina) looking a lot less moribund! Amphibians are cold-blooded animals that enter a state of semi-dormancy, similar to hibernation, during the cold, winter months in order to survive. 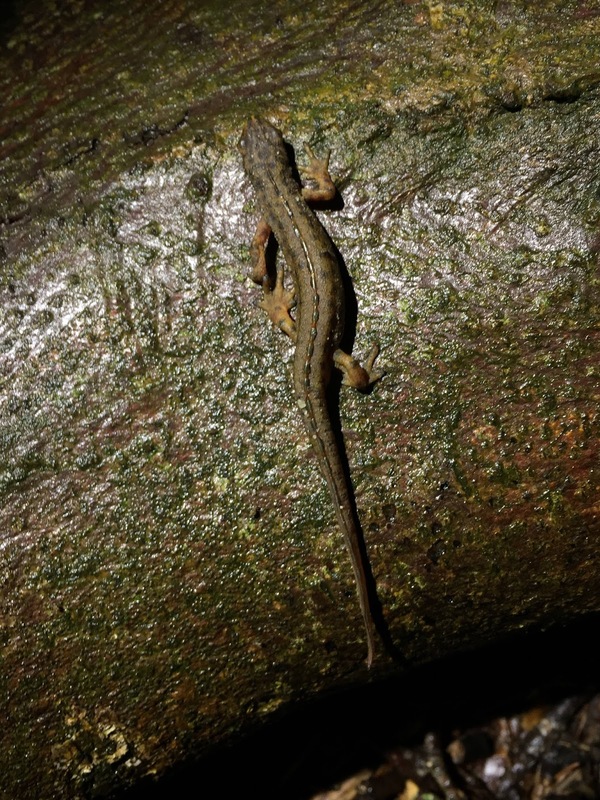 It is called brumation, and they brumate in burrows, crevices and under logs where it is dark and damp. 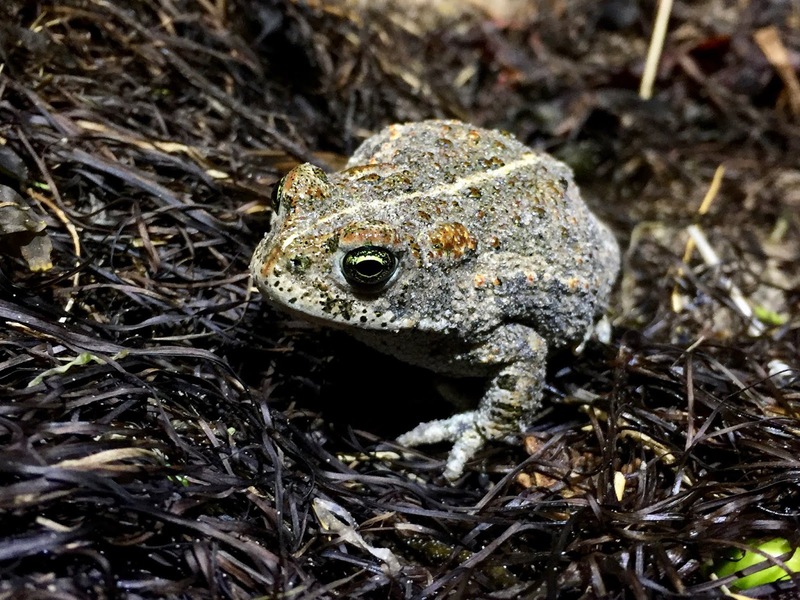 There are 7 species of amphibian in the UK: 2 frogs, 2 toads and 3 newts. The rarest of them all is the Pool Frog Rana lessonae, which is only found at a few secret sites following reintroduction programmes. between some of the UEA student accommodation. Of the 3 newt species, the Smooth (Common) Newt Lissotriton vulgaris is the most widespread and common. It is much smaller than the Great Crested Newt Triturus cristatus, but is very similar to the Palmate Newt Lissotriton helveticus. 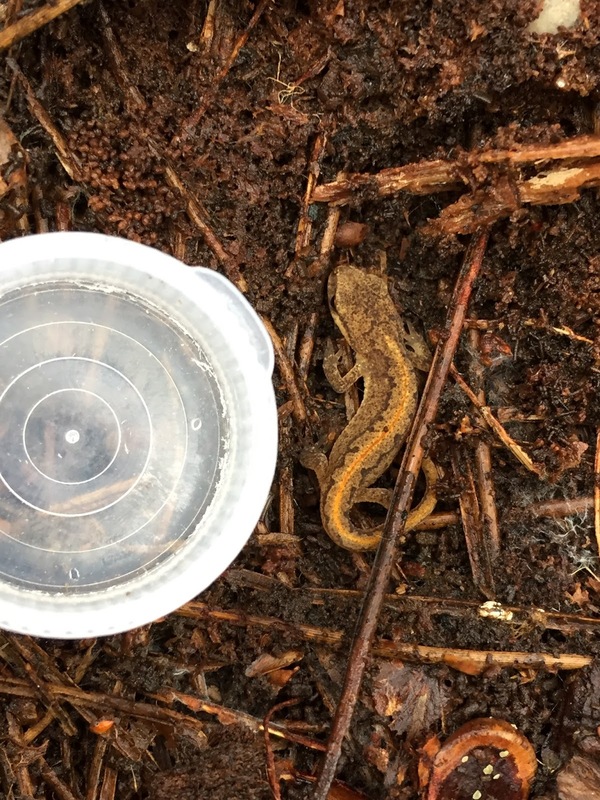 In order to distinguish between Smooth and Palmate Newts, you have to look at the underside, as both sexes of Smooth Newt have white throats with dark spots, whereas Palmate Newts have unspotted pinkish throats. The males of all 3 newt species develop a wavy crest on their backs during the breeding season, however it is very low and smooth in Palmate Newts and much more developed in Smooth Newts. with lots of fallen and dead wood for it to brumate (hibernate) under. The reproductive strategies of the Smooth Newt are similar to those in the better known Common Frog Rana temporaria. 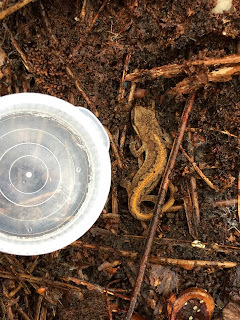 The male Smooth Newts display to the females by vibrating their tails in a particular fashion and when she indicates that she is ready to mate, the male deposits a capsule containing his sperm in front of the female so she can pick it up with her cloaca. The female will lay her fertilised eggs individually, wrapping each one in an aquatic plant. A single female can lay 7-12 eggs per day and may produced 400 eggs in one season. After about 2 weeks, the eggs hatch into larval form, first feeding off the nutritious contents of the yolk sac, before beginning to eat freshwater plankton, insect larvae and molluscs. Unlike frogs and toads, newts are carnivorous throughout their lives. 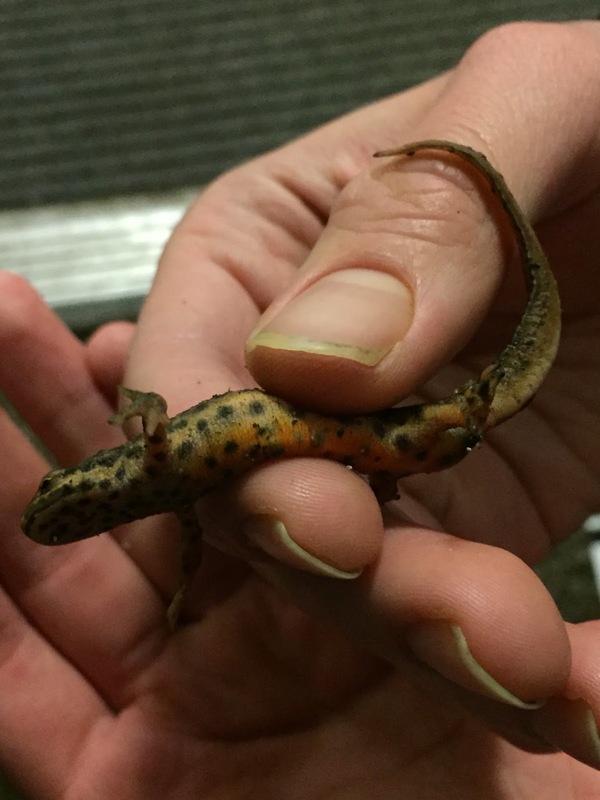 The juvenile newts develop into smaller versions of the adults and leave the water after ~10 weeks. Smooth Newts take around 3 years to become sexually mature, and have an average lifespan of 6 years. Most adult and juvenile newts brumate over winter, emerging in the spring. Liverworts are non-vascular plants which, along with the mosses and hornworts, make up the bryophyte group. Of the different bryophytes, there are 763 species of moss, ~300 species of liverwort and just four species of hornwort in Britain and Ireland. Liverworts are split into two main groups based on their structure: leafy liverworts, which have leaves and a stem, and thallose liverworts, which don't have leaves or a distinct stem, but have flattened, lobed, leaf-like bodies called thalli. Hornworts are superficially very similar to the thallose liverworts, and are often regarded as 'honorary liverworts', however they differ slightly to liverworts in their reproductive methods and structures, whereby asexual reproduction occurs primarily via fragmentation as lobes separate off from the main part of the thallus. In hornwort sexual reproduction, archegonia (female part) and antheridia (male part) are produced in rows just beneath the upper surfaces of the gametophytes and the sporophytes grow into long, horn-like structures, with the sporangium located at the tip. These sporophyte 'horns' are very long lived (unlike liverwort sporophytes) and can grow quite long. Hornworts are also distinguished from liverworts by the presence of stomata and cuticle, which is also seen in the mosses. 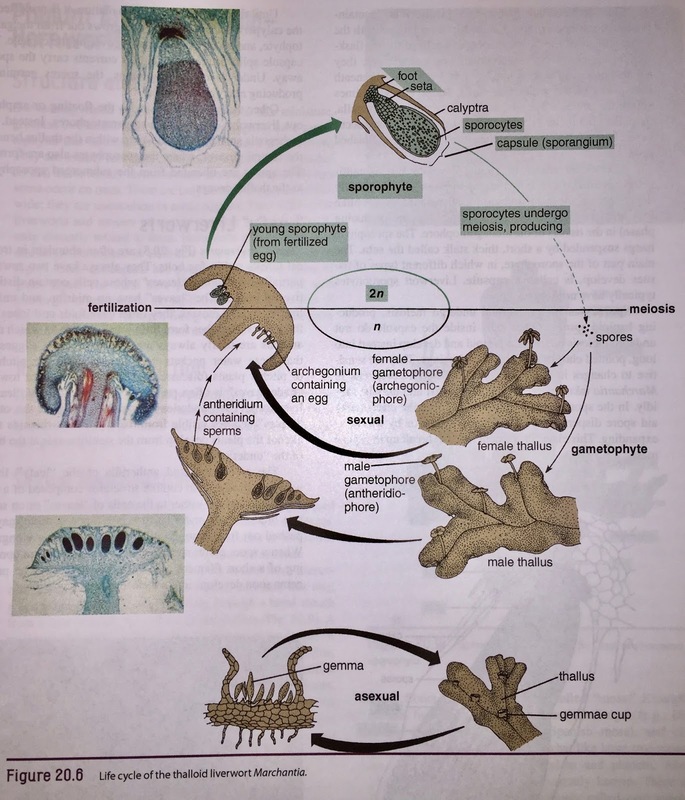 In liverworts and hornworts, reproduction occurs via the alternation of generations where the gametophyte stage is dominant (unlike other plants such as clubmosses and ferns which have dominant sporophyte stages) reproduction can occur sexually or asexually. The way in which liverworts reproduce also depends on whether they are leafy or thallose. 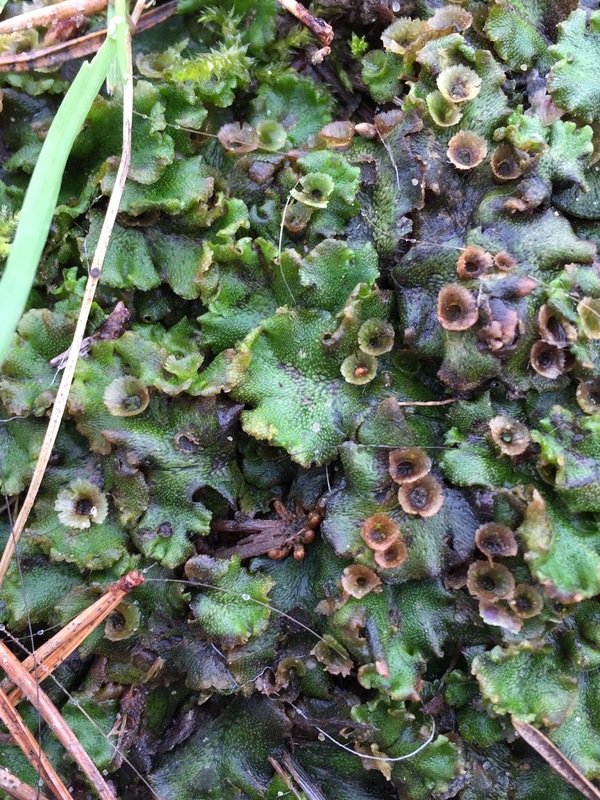 The sexual reproduction of liverworts occurs predominantly during the winter months when conditions are wetter. This is because their spore dispersal is water dependent. Leafy liverworts always have two rows of partially overlapping 'leaves' which don't have midribs, but do often have folds and lobes (unlike the 'leaves' of mosses). Rhizoids are present on the underneath of some underleaves, which help anchor the plants. The male and female reproductive structures (archegonia and antheridia) of leafy liverworts are inconspicuous, and are produced in cup-like structures made out of some modified leaves on separate plant bodies. At maturity, the sporophyte capsule is pushed out from among the leaves as the seta (stalk) elongates. Sporophyte development in leafy liverworts. 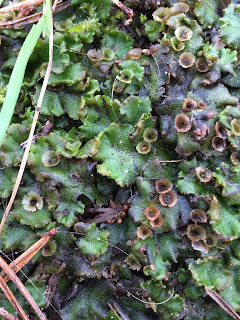 Some of the best-known species of thallose liverworts are in the Marchantia genus. Asexual reproduction in thallose liverworts occurs via a rather cool system, in which structures called gemma cups form on the top of the liverwort gametophyte (thallus). 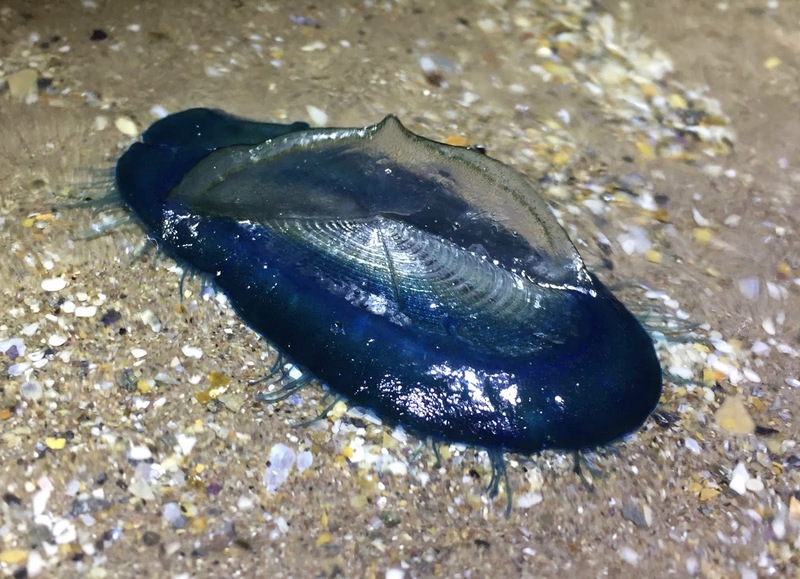 These gemma cups colonially produce identical 'leaflets' (gemmae) within them, which are then dispersed into the wider environment via rain splashes - raindrops may splash the gemmae up to 1m away! While the gemmae are in the gemma cups, lunularic acid inhibits their further development, but each gemma remains capable of growing into a new thallus as soon as it leaves the cup. In the sexual reproduction of thallose liverworts, there are two types of gametophores (umbrella-like structures on stalks which arise from the thallus): the antheridiophore (male gametophore) and the archegoniophore (female gametophore). The two gametophores are shaped differently, with the male 'umbrellas' being disc shaped and the female receptacles shaped like miniature palm trees. Reproductive structures of thallose liverworts. Fertilisation causes the development of sporophytes anchored to the underside of the archegoniophores. Meiosis occurs in certain cells within the sporophyte, creating haploid spores, but the rest of the cells do not undergo meiosis, instead remaining diploid and developing into long, pointed elaters with spiral thickenings. 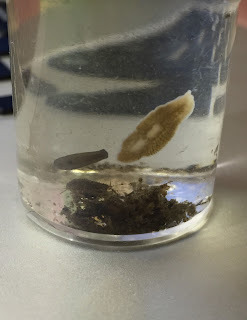 The elaters are hygroscopic and therefore change shape in the presence of water. This causes the elaters of Marchantia to rapidly twist and untwist, causing the spores to be shaken out of the sporophyte, ready to be dispersed by water. Marchantia polymorpha is a large, thallose liverwort that is widely distributed around the world, and is also found on the UEA campus. It is very variable in appearance and has several subspecies, 3 of which are found in Britain and Ireland. The subspecies I found at UEA is Marchantia polymorpha subsp. ruderalis (aka the Common Liverwort). As with all liverworts, M. p. ruderalis has a horizontal growth structure and no vascular network to transport water or nutrients, instead relying on its large surface area and preference for damp conditions. Due to the changeability of environmental conditions, liverworts are well adapted to tolerate desiccation; their flat structure maximises photosynthetic abilities and they minimise water loss by only having pores (for respiration and photosynthesis) on their upper side. gemma cups present on the upper-side of thallus. Found on the UEA campus 03/02/18. Silpha atrata, also known as the Black Snail Beetle, is a member of the Silphidae family. The Silphidae comprise 21 species of large (9-30mm), distinctive species, which are mostly associated with carrion. 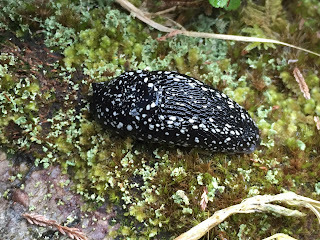 There are exceptions to this however, with both Aclypea species being herbivores, Dendroxena quadrimaculata is an arboreal predator of caterpillars, and Silpha atrata itself is a predator of snails, hence its common name. There are a number of distinctive characteristics that separate the Silphids from other beetle families, including a head that is often much narrower than the pronotum, very robust mandibles that are often pronounced forward, generally well developed and prominent eyes, antennae with 11 segments and robust legs which often have outwardly facing spines on the tibia (not present in Necrodes) and well-developed claws. 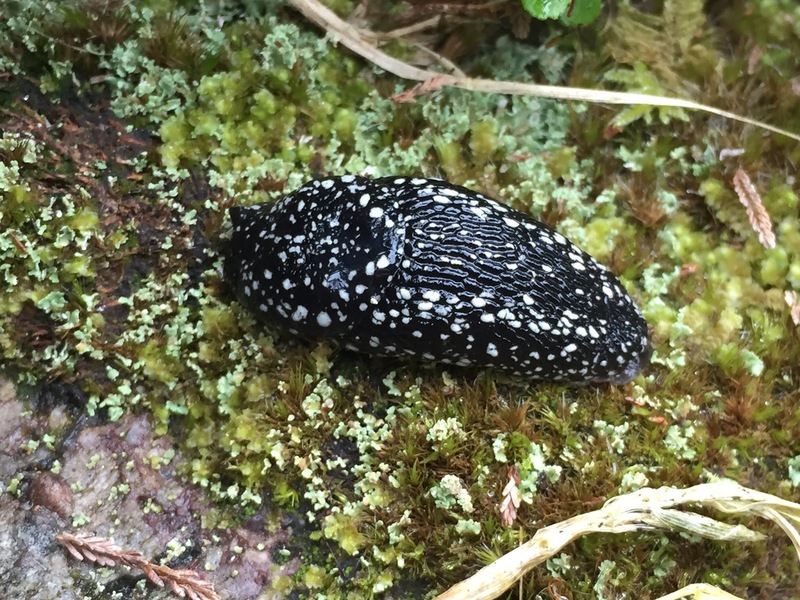 Silpha atrata found under deadwood on UEA campus. Silpha atrata is one of the smaller members of the Silphidae family, measuring 10-15mm in length. Individuals of this species can vary greatly from completely black to almost red in colour, and extremes of both colours along with intermediates are all common and are often found together. S. atrata is widely distributed throughout the UK, and is abundant in a range of habitats, including woodland, meadows and gardens. Both the adults and larvae feed on pulmonate snails and earthworms. In order to capture their prey, the adults inflict the unfortunate snails with a poisonous bite which causes the snail to withdraw into its shell and fill the entrance with a thick fluid. The beetle then eats its way through the fluid, with some assistance from a secretion that helps dissolve the fluid and the snail tissue. S. atrata has a long, extendable neck which comes in very handy for this particular feeding behaviour. S. atrata is rather odd in its behaviour as you generally expect beetles to be inconspicuous during the cold, winter months and more noticeable during the summer, however S. atrata don't follow this train of thought; they are active under logs and beneath the bark of fallen or standing deciduous trees from October, usually in very damp conditions. In January and February they can be found in large numbers, and may be seen out in the open during the first warm days of March but after April or May, they are seldom seen, probably due to their preference for dark, damp conditions. Three individuals of S. atrata plus one Woodlouse sp. Found in deadwood on UEA campus. Leaf mines are mainly caused by species of Lepidoptera (moths), Diptera (flies), Hymenoptera (sawflies, bees, wasps & ants), and a few Coleoptera (beetles), whose larvae feed within the leaves of plants. As the larvae feed and grow, they move throughout the leaves, creating mines. The mines created by these species are often very distinctive and, coupled with the fact that leaf-mining species tend to be restricted to a certain range of host plants, it is often possible to identify mines to an individual species. Lepidoptera normally make full depth galleries or blotches with single lines of frass (droppings). Diptera mines are either lower- or upper-surface (or a mix of both), their larvae are maggots and they characteristically make twin trails of frass. Hymenoptera mines are blotches rather than galleries and characteristically have extensive amounts of dark frass (compared to diptera mines). The larvae of Hymenoptera also have visible legs. Phytomyza ilicis is a species of fly (diptera) whose larvae mine the leaves of Holly (Ilex aquifolium). P. ilicis is incredibly common and is the only species to mine Holly in Britain, making it very easy to spot and identify! 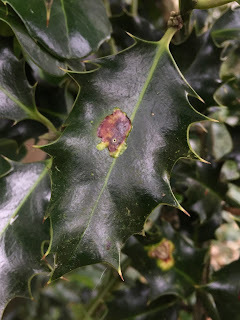 It is abundant on the UEA campus, with P. ilicis mines visible on just about every Holly bush you come across.